Every Halloween, many of us break out a string of scary movies to fill our October. A lot of those movies are ones we watch throughout the year. But what about music? What special tunes do you listen to for a scary Halloween or to build up to the spooky holiday? For sure, there's the low-cost Spooky Sounds-type CDs you can get at Target or your local CVS, but what about familiar tunes that just happen to be scary? You could spend hours compiling a list of your favorites, like "Monster Mash" and "Purple People Eater", but wouldn't it be easier if there was just one album, filled with great music, already put together and waiting? The band Sunspot is Wisconsin's greatest contribution to the world of paranormal entertainment. With songs like "El Chupacabra" and "Hottie Illuminati" their songs cover a range of topics, from dinosaurs ("Archaeopteryx") to Ancient Aliens ("Chariots of the Gods"). 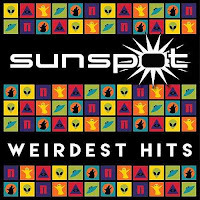 With catchy tunes and clever lyrics, Sunspot cranks out tune after terrific tune--music that's suitable for any local radio station or for some of our favorite B Movies and Scifi Shows. But great music isn't Sunspot's only contribution. Drummer Wendy Staats and Vocalist/Bassist Mike Huberty also delve into the paranormal and supernatural in their weekly podcast, "See You On the Other Side". With interviews and college lecture-worthy discussions on various topics, they entertain and educate on a variety of subjects--and end every episode with one of their catchy tunes. I discovered Sunspot more than a year ago while searching for podcasts to listen to. I was immediately hooked and have become a fan of their music, adding their tracks to the same playlists I use when writing my own Supernatural Thrillers. They fit nicely alongside classics by the likes of ZZTop, AC/DC, and CCR, providing appropriate background music for whatever mood I need for different types of scenes. The best thing about Sunspot though is how genuine they are. They're regular folks who attend conventions, are obsessed with scifi/pop culture, and routinely engage with their fans. Listening to their work, one can't help but cheer on these amazing performers and eagerly await the day they finally land a tune in a Marvel Cinematic Universe movie soundtrack, or the latest episode of X-Files. They'd definitely be on the soundtrack if I ever got to do an adaptation of one of my books. Sunspot's offical bio reads: With their uncanny lyrics, massive harmonies, and six-string fireworks, Sunspot has been touring the rock underground for over two decades. Just beyond the radio and just outside the mainstream, Sunspot sings driving electro-rock anthems that capture the fantastic and bring it back down to Earth. But just who are Mike Huberty, Wendy Staats, and Ben Jaeger? Listening to the podcast, you can pick up a lot of details about the dynamic duo of Staats and Huberty. How did you come up with the idea to do "weird" songs? I think that’s been in our DNA since the beginning. Bands like Alice Cooper, Rush, and Iron Maiden were part of our original influences and they looked to science fiction and horror for some of their themes, it seemed a perfect way for us to differentiate ourselves. What's your favorite "conventional" song to perform? Our song, “Eat Out My Heart” because everyone has an ex. Have you ever watched a movie or TV program and thought one of your songs would have been a better fit for the soundtrack? What was it and what was the song? Easily John Carpenter’s In The Mouth of Madness, the Metallica ripoff at the beginning just doesn’t quite fit with the printing press opening. Our track, “An Indifferent Universe” would make a much spookier opener as well as be much more fitting to the Lovecraftian theme of the film. Also, the “Doctor Feelgood” homage in Highlander: The Final Dimension would much better be suited to our track “Neanderthal”, it’s way more intense and fitting. What's the most important part of storytelling in a song? Helping the listener bring the meaning of the song into their own lives. Finding the words and music that expresses a feeling that we can all understand. Or at least, finding a way to express something yourself and hoping it connects with someone else who feels the same thing. What instrument is most suited to playing a song that instills a scary, creepy vibe? What's the scariest place you've ever played? Well, we’ve played plenty of dives that probably should be condemned. But the most supernaturally strange place must be the Fill-Mor Theatre in Wausau, Wisconsin. There was a piece of metal that fell from the ceiling and almost killed Ben out of nowhere, there were weird feelings all around the place, mysterious electrical disturbances, and plenty of ghost stories from the staff. Has there ever been a topic too strange, frightening, or otherwise disturbing to do a podcast on? I wrote a song called “The Choking Game” because I thought it seemed like just another teenage rebellion thing to sing about. But there’s someone not too far out of our circle whose kid have actually died from it, so we vetoed it as too raw of a subject to make fun of. And it was really just to push buttons, it isn’t authentic to our experience, so we switched it to something that was. After doing your podcast for so long, and meeting so many people, whats the craziest thing you've ever heard of? Sometimes it feels like the craziest thing to believe is that none of this stuff actually exists. Not just skepticism, but people dismissing all these stories as hoaxes and imagination. There are too many experiences out there for too many people. Some of them are hoaxes and some of them are imagination, but there’s more to it and I think just sweeping it under the rug as delusion does humans a real disservice. Scenario: Our alien overlords outlaw music--what art form do you pick to continue entertaining people, or do you give up the arts completely? Tap dancing! Nah, I’d probably just talk people to death with slam poetry or something. Scenario: Upon death, you have the choice to haunt a location or a musical instrument: which do you choose? I’d haunt as many saxophones as I could and try to prevent saxophone solos from ruining perfectly good rock songs. Scenario: You have the ability to incontrovertibly prove to the world ONE cryptid absolutely exists--which cryptid do you choose? Bigfoot, of course! Another hominid intelligent species would be fascinating to study and interact with. Plus, if more people knew how connected to primates we were, we might start treating them better! Scenario: For one twenty-four hour period, would you rather be abducted by aliens, possessed, or transported to an alternate reality? Possessed. I already believe that aliens are out there, they have to be. Doesn’t mean they’re visiting Earth, but I already think they’re somewhere out there. Also, alternate realities might be cool, but I think that’s possible too. I don’t know if I believe in supernatural entities, getting possessed by one would be the proof! Scenario: You are given the ability to resurrect any one TV show, including its stars at the height of their popularity, but while the show is in production, and first run, you have to give up performing yourself. Would you? And for what show? Doctor Who with Tom Baker and Louise Jameson, my favorite run of the show. I’d take a break from playing if we could see a couple more years of classic episodes. There's also a Patreon page for the Podcast, or you can head over to iTunes or Amazon and check out some of their great music.